We love warm-weather Olympians here at Fourth-Place Medal. How can you not? We've already covered Ghana and India, but now we can have a look at Ethiopia's entire Olympic squad. His name is Robel Teklemariam. Teklemariam was born in Addis Ababa, the capitol of Ethiopia, and then moved to the United States at age 9. 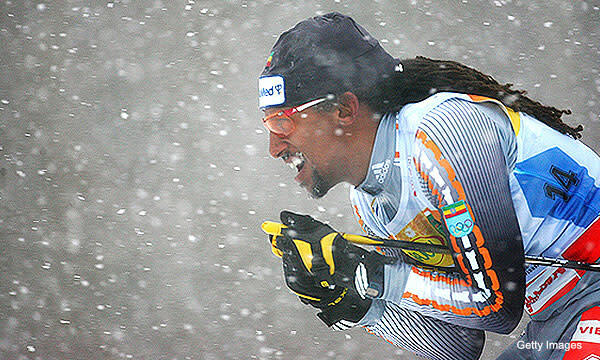 Three years later, while enrolled in a boarding school in Lake Placid, New York, Teklemariam was introduced to cross-country skiing and fell in love. Inspired by fellow Ethiopian Abebe Bikila — a barefoot marathoner who was the first black African to win a gold medal — the skier dedicated himself to making the Olympics. In 2006, he achieved his dream, and now, at age 35, he's headed to Vancouver hoping to improve on his finish. If all that seems unlikely, consider what Teklemariam had to go through just to have the chance to qualify for the Olympics. Prior to his involvement, Ethiopia had no Winter Olympics committee, no ski federation, and basically no way for any of their citizens to even try to compete in a Winter Olympics. After three years of hard work, Teklemariam established all the necessary entities required to compete in the Olympics. In Turin he even beat 15 other competitors. As you can imagine, there's not a ton of snow in Ethiopia, so Teklemariam trains by roller skiing down the streets of Addis Ababa. It's not the ideal training method, but when you're as driven as this guy, that's the least of your worries. Here's hoping his Olympic success is as great as his personal success.